← Strange Spotlight Surrounded by Half Moon of Multicolored Gases. PHOTO OF “SPOTLIGHT” OBJECT (FALCON 9 ROCKET). Description: On the evening of October 7, 2018 a Falcon 9 rocket was launched by SpaceX from Vandenberg Air Force Base in California. The rocket took off from the Vandenberg Air Force Base, northwest of Los Angeles, at 7:21 PM local time (3:21 AM UK time), Bloomberg reports. The main booster stage then returned and touch back down at the launch site eight minutes later. 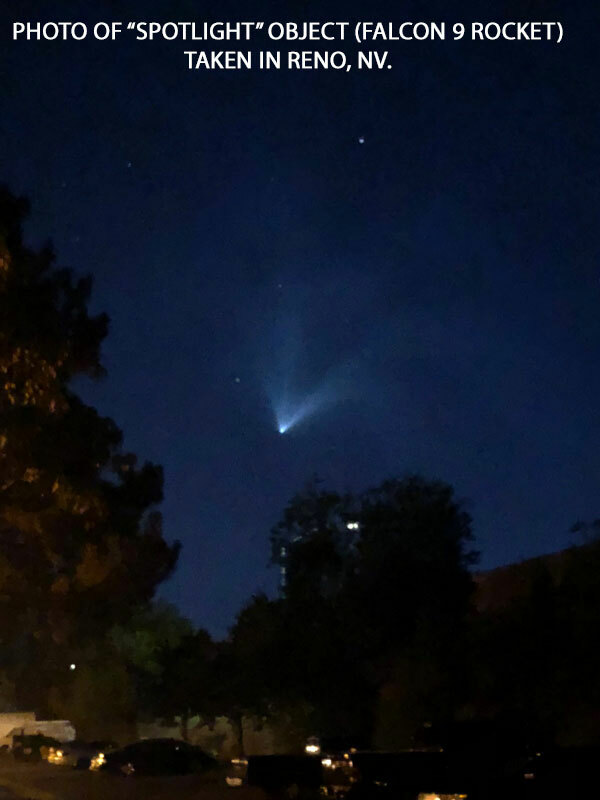 This entry was posted in bright light, Photos, Possible rocket, Special Reports, UFO Sightings 2018, UFO Sightings Arizona, UFO sightings California, UFO Sightings Nevada. Bookmark the permalink.